A couple of months before the Totterdown Arts Trail, I said ‘it’s all about the small things’ during a conversation with Toby. At this time I was also struggling with a concept and a starting point for my new work. We both looked at eachother in that kind of ‘i think you have a good idea there kind of way’ and that’s where it all began. This concept could go on and on and on and I will work on more pieces based on this idea. But for now, here are the examples of work I produced for the arts trail. I have shown photographs of the actual finished prints, since they are all handfinished and I wanted to showcase them in their finished state. However, I will get some jpgs of the computer files on here too eventually as they show the colours a bit better. Each print shown here is 12x12cm in image size. They are on sale for £50.00 framed and £40.00 unframed. ENJOY! It’s all about cake – Hand finished with a sparkly butterfly. This print is printed on a beautiful gold paper. 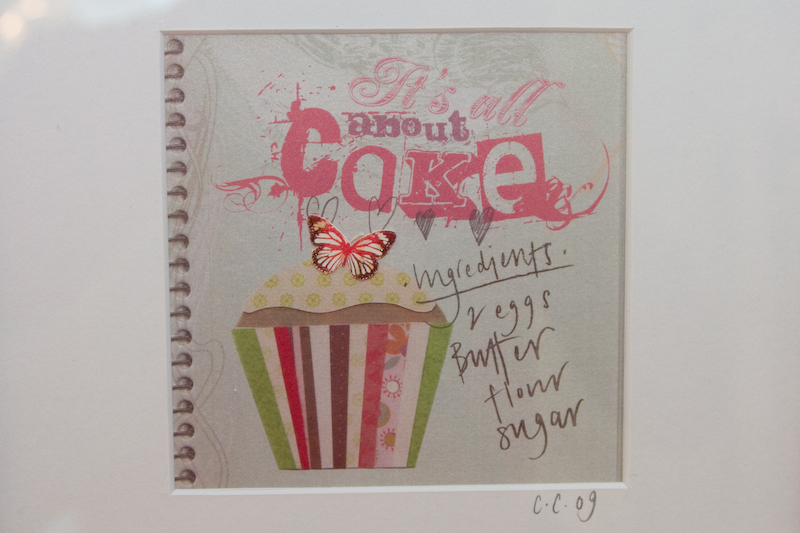 The cake was hand made using different types of paper and then scanned in. The hand writing is mine, scanned in. 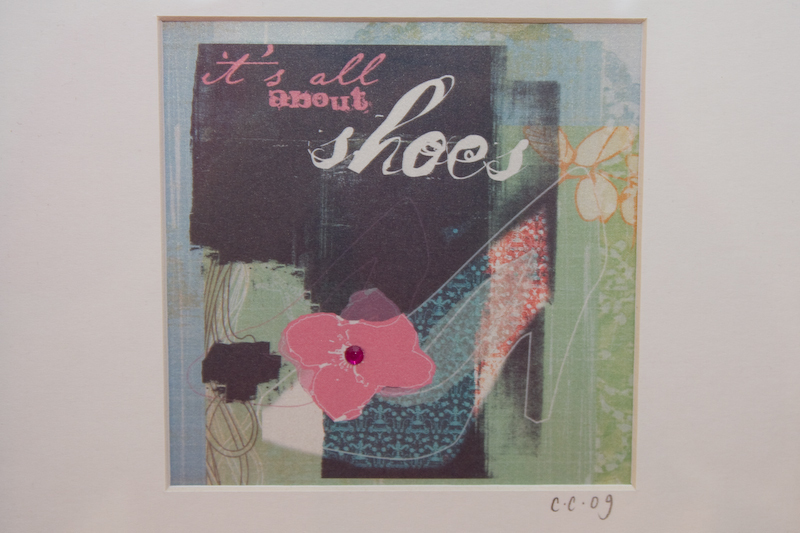 It’s all about shoes – This print is printed on gold paper and hand finished with a pink jewel. The background is made up of different papers and materials scanned in and the shoe and flower were drawn using illustrator and photoshop. 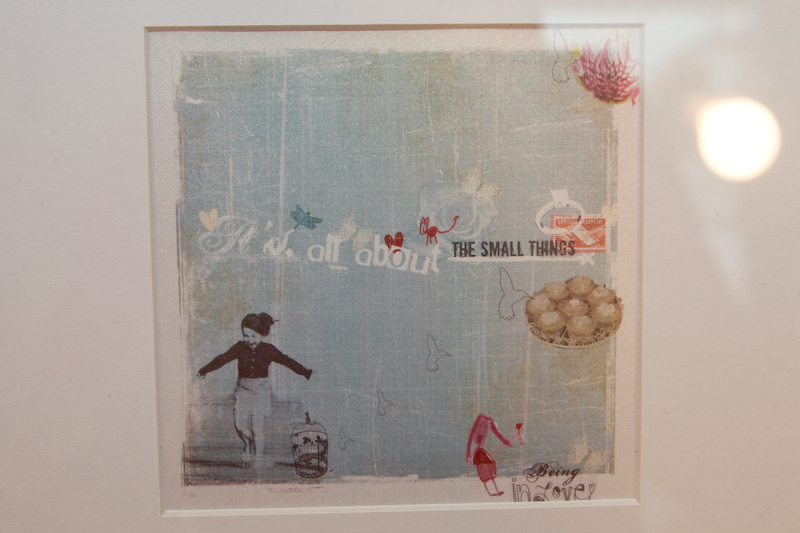 It’s all about the small things – Printed on gold paper this print was made using a variety of photographs (matilda our 6 year old daughter, on the beach in watergate bay), some of her drawings scanned in and other photographs and drawings. 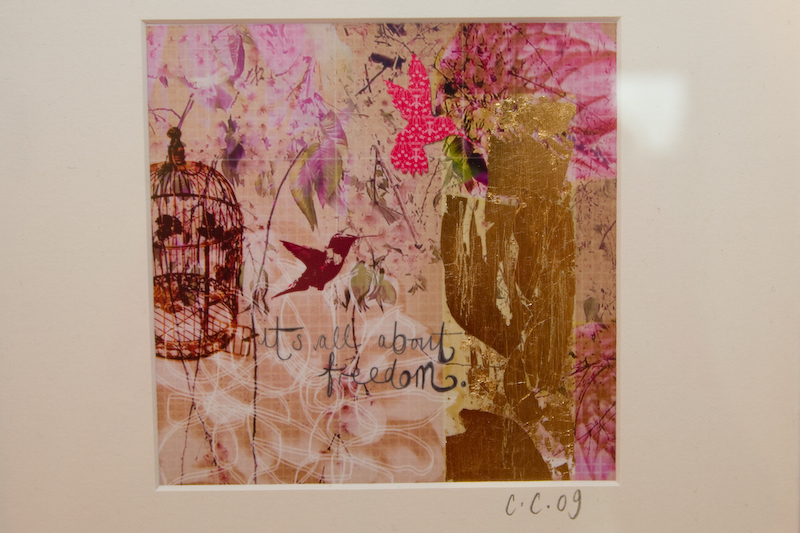 It’s all about freedom – This print was created using different papers and materials scanned in for the background, birds drawn in illustrator and photoshop and my handwriting scanned in. It was then hand finished with gold leaf. It’s all about love – For this print I wanted to create a feel that it was a sketchbook doodle, hence the school book background. I used a mixture of my handwriting and fonts for the words and my handdrawn hearts. 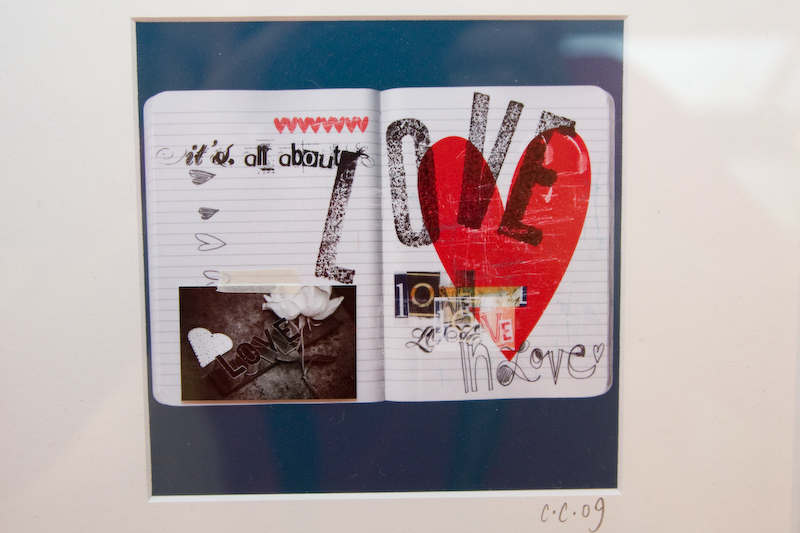 This print was hand finished using letterpress stamps for the large word ‘love’ and also by printing separately the photograph (taken by my husband) of the heart and rose and stuck on with masking tape. 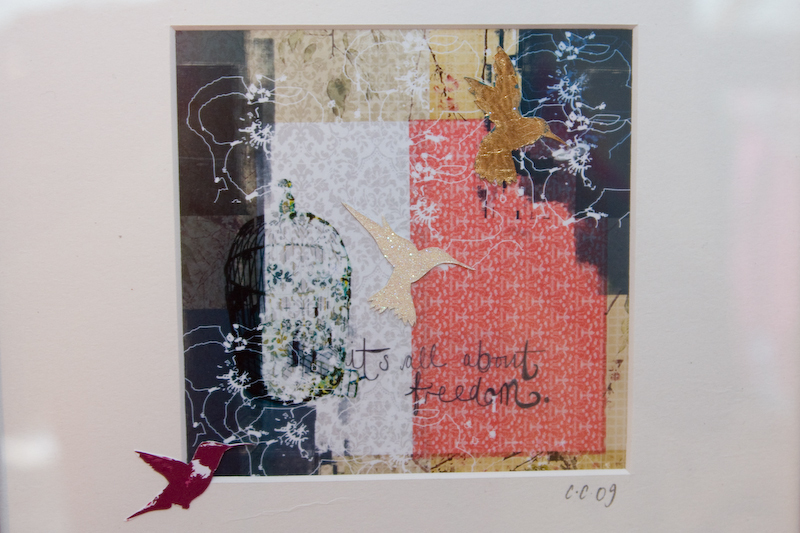 It’s all about freedom – Again this print was made using scanned in papers for the background, mixed with photoshop work. the birds are drawn in illustrator and photoshop and the print is hand finished with a gold leaf bird and also a bird cut out of card. 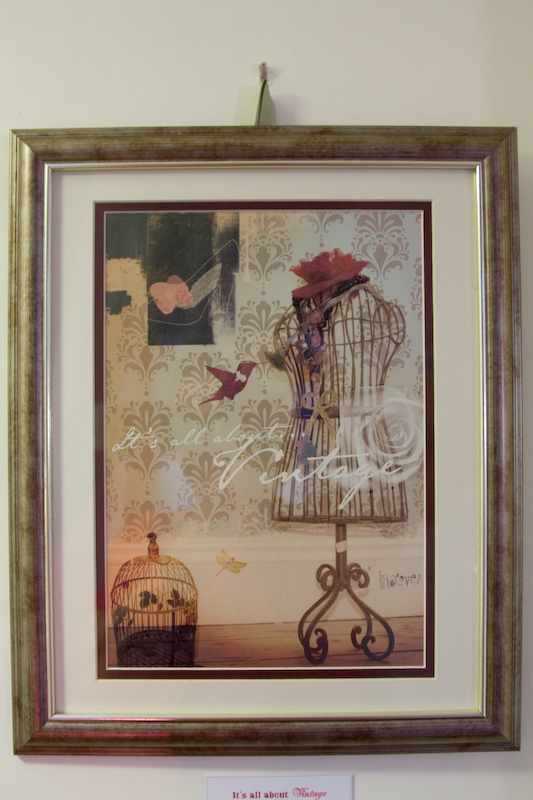 It’s all about vintage – This print is a culmination of photographs (taken by Toby) and things drawn in illustrator and photoshop. This piece is also hand finished with gold leaf. 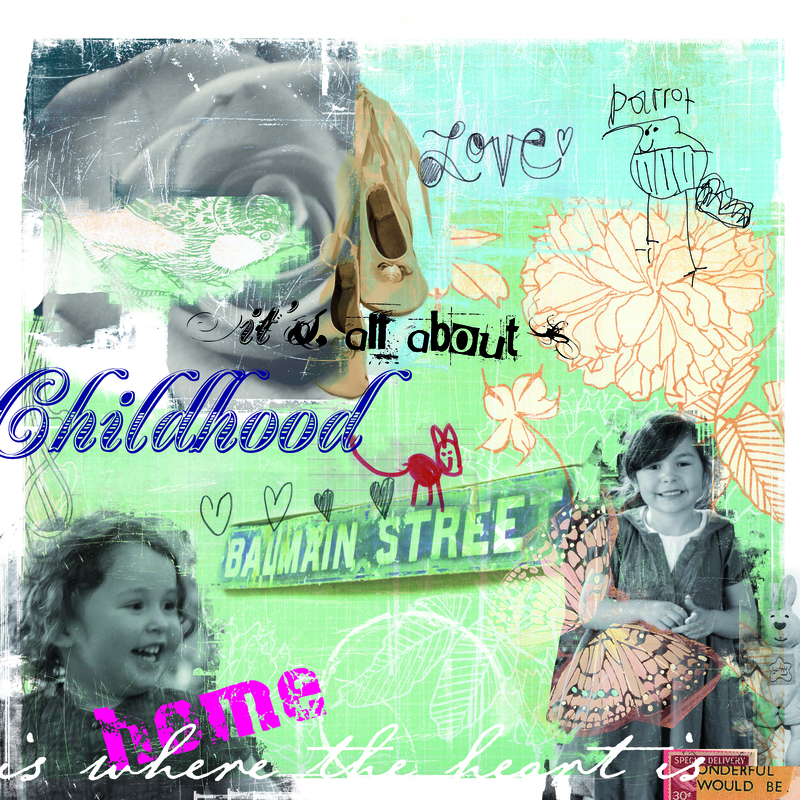 It’s all about childhood – This print is made using a mixture of photographs (taken by Toby), drawings by the girls, my handwriting, scanned in and various papers and materials scanned in to create the background.